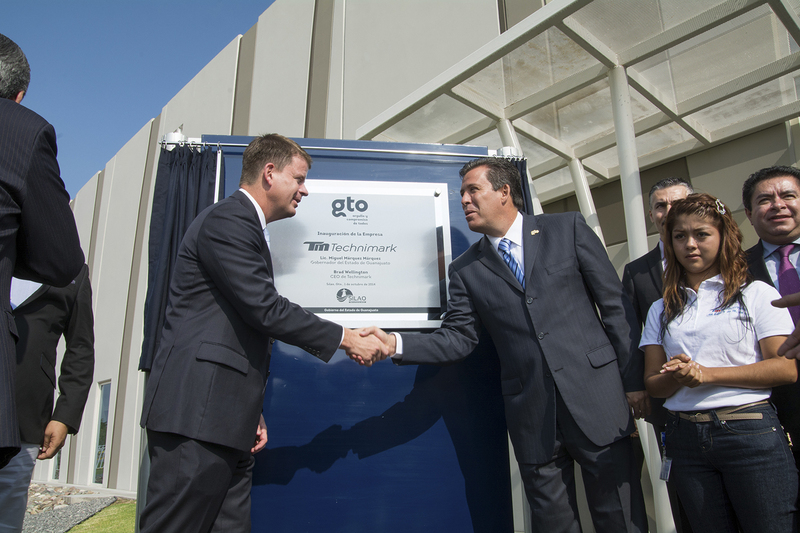 Silao, Guanajuato, Mexico, Oct. 6, 2014 – Technimark, a leading global injection molder and producer of custom rigid packaging and highly technical durable components, today celebrated the grand opening of its newest manufacturing facility in Silao, Mexico. Technimark has made an initial investment of more than $5 million in the new 93,000-square-foot facility, its third in Mexico. As its business grows, Technimark plans to nearly double the size of the plant to 160,000 square feet and eventually employ more than 250 people. The Silao plant will house state-of-the-art injection molding, automation and decoration equipment to enable high-volume production of innovative primary packaging solutions. Founded in 1983, Technimark is a global leader serving a number of the world’s most respected companies and brands in the packaging, healthcare and select industrial markets. The company provides end-to-end services ranging from packaging design and material selection to injection molding and decoration through global product distribution. With headquarters in Asheboro, N.C., the company operates a total of six global manufacturing sites in the United States, Mexico, Germany and China. The company’s other Mexican plants are located in Mexicali and Reynosa. “The key to Technimark’s success over the years has been our relentless focus on product innovation, technical excellence and exceptional service,” said Kris Peavy, senior vice president of sales and marketing. Technimark is hosting a two-day grand opening celebration Oct. 1 and 2 for local dignitaries, government leaders, customers and employees. The Governor of the State of Guanajuato, Miguel Márquez Márquez, participated in the dedication ceremony. In addition to the new plant in Mexico, Technimark is also expanding its operations in Germany, at its headquarters in North Carolina and in Suzhou, China. “Our clients rely on Technimark for innovation and for technical expertise, and we are excited to expand our footprint in Mexico and further leverage our advanced technical capabilities with our Latin American customer base,” said Brad Wellington, CEO and president of Technimark. “Our existing facilities in Mexico have done an outstanding job executing our technology strategy, and we look forward to growing our business in Silao with the region’s well-educated and skilled work force, solid infrastructure and welcoming community,” Mr. Wellington added. For more information about Technimark, visit the company’s website at Technimark.com. Technimark is a global manufacturer of high-value injection-molded components for the consumer packaging and select consumer nondurable end markets. Founded in 1983 and headquartered in Asheboro, NC, the company has become one of the largest independent custom injection molders in North America. Technimark boasts a broad customer base that comprises some of the world’s largest and most successful brands.